These DC powered heaters connect directly to the vehicle battery. They Do Not Plug Into a Lighter Socket! These DC Thermal Heaters are some of the most powerful direct current heaters available today. A Digital Temperature Controller can be added to ANY heater so that you can control the heat in your cabin or vehicle with the touch of a button. You set the desired temperature and it does the rest! DC Thermal heaters are hand built in the USA with only the very best parts, motors, and wire. The heater housing is constructed out of vinyl clad aircraft aluminum and is riveted at the seams. This heater was designed to last you a lifetime. This heater will work in any vehicle with a DC electrical system from 12-48 volts including cars, trucks, vans, buses, heavy equipment, etc. Available in 12, 24, 36 or 48 Volts. Measuring only 9" x 5" x 4" means it will fit into most tight spaces. 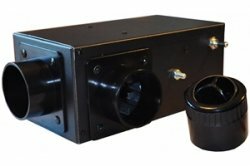 This DC Powered Ducted Heater is fully customizable to meet your specific needs. Up to four (4) ducts can be added to the heater allowing you direct control over heat delivery. Accessories for this heater (sold separately) include four (4) vent styles with or without vent mounting brackets, duct sections that measure six feet (6') in length and ducting accessories. Please use the comment area during checkout to specify where you would like the ducts installed on your heater. Use the detailed image above as a guide. All heater model variants include a toggle switch which has three positions. The toggle switch position options are Low, Off and High power. When high power is selected the heater will perform as described here. When the heater is switched into low power mode the heater will use one third (1/3) to one half (1/2) of the power described here. These heaters use different numbers of heating elements and the toggle switch from low to high determines how many elements are powered on. For heaters that include two heating elements the low toggle position will power just one element, the high position powers both. Heaters with three elements with the toggle in the low position two of the three elements will be powered. Heaters built with four elements with the toggle in the low position two heating elements will receive power while the other two remain powered off. The new heater is fantastic. You guys were a great help in deciding which model was best for my application and I really appreciate that. This was very easy to install and the benefit from the heat output far outweighs the cost of the unit. This is a good direct current heater that I would recommend to anyone in need of a lot of heat without tapping into the vehicle's cooling system as many others require. Bill T.
Exactly as described. Exactly what we needed. This unit is plenty powerful and it attached into the original duct blower box in the bus. We will keep an eye on it a bit longer but will likely be purchasing several more of these in the near future for use in our other outdated vehicles. Thank You.